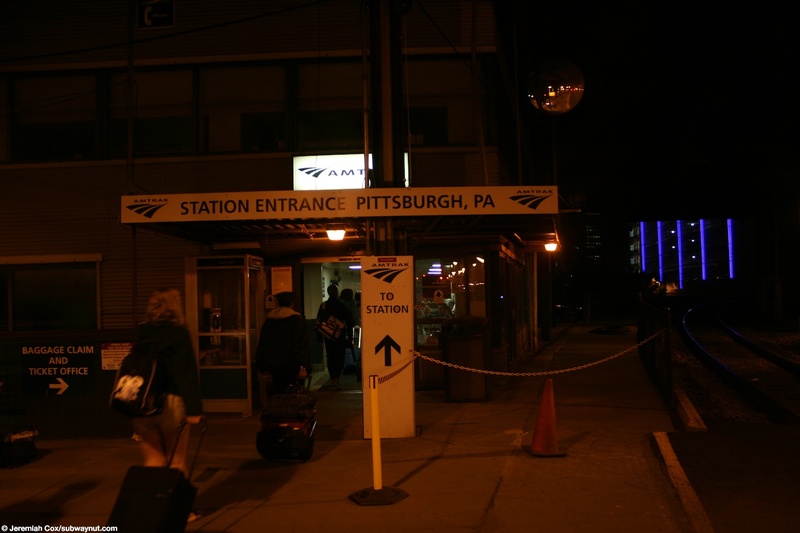 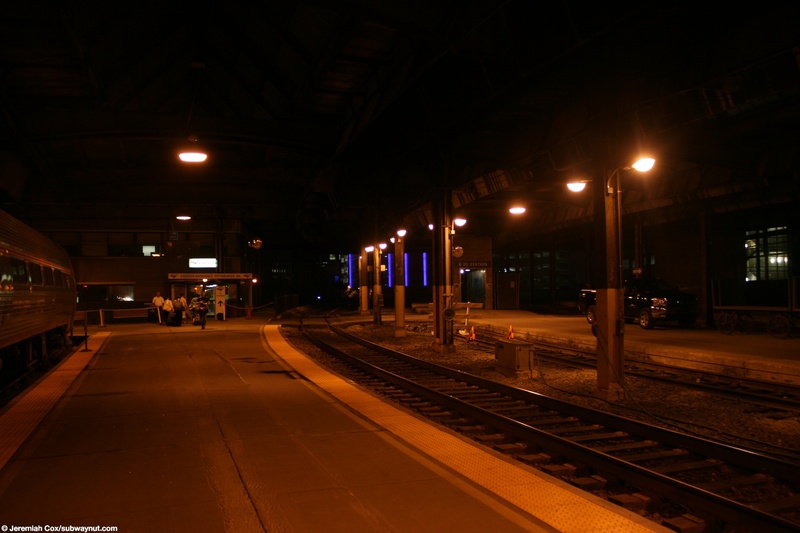 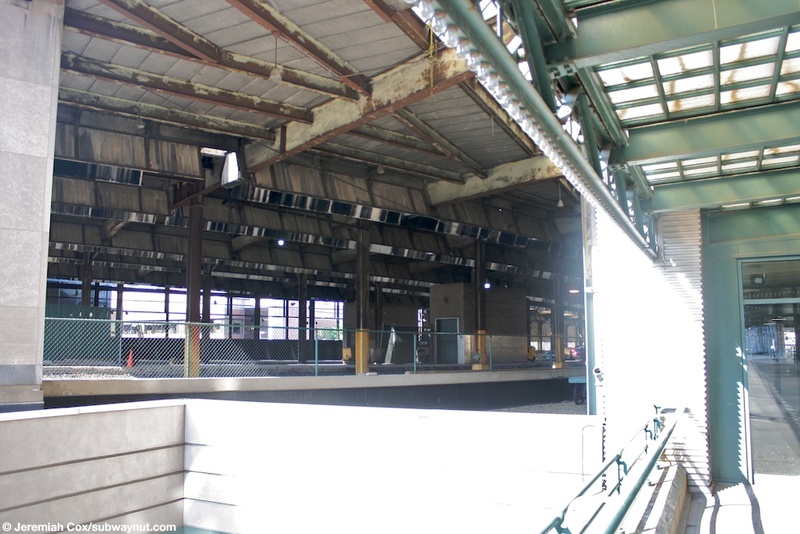 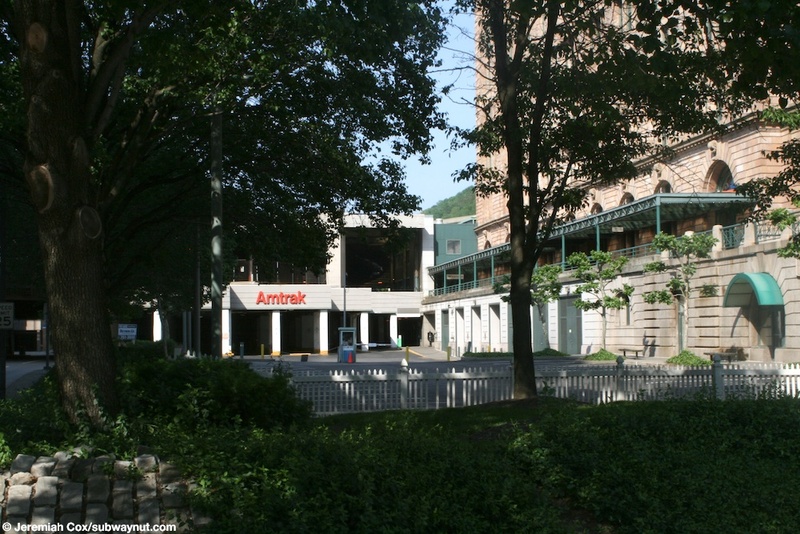 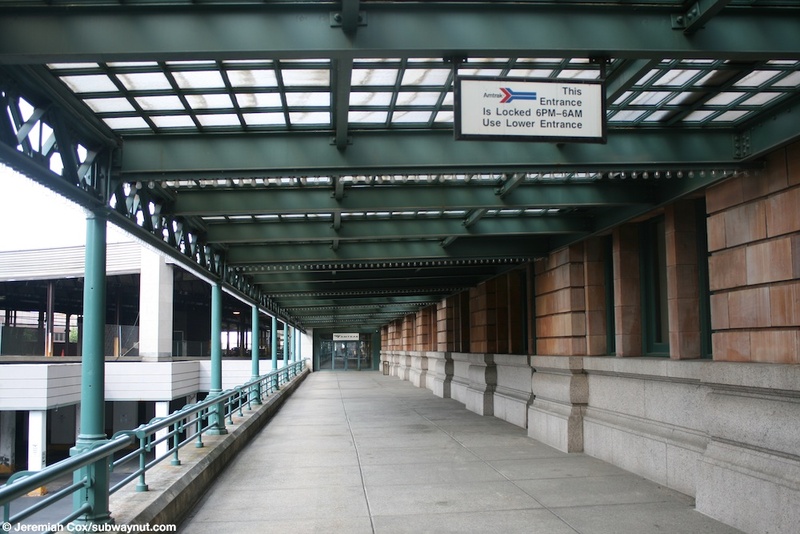 The Pittsburgh Amtrak Station is located in a viaduct as the line goes through Pittsburgh, quite near downtown. 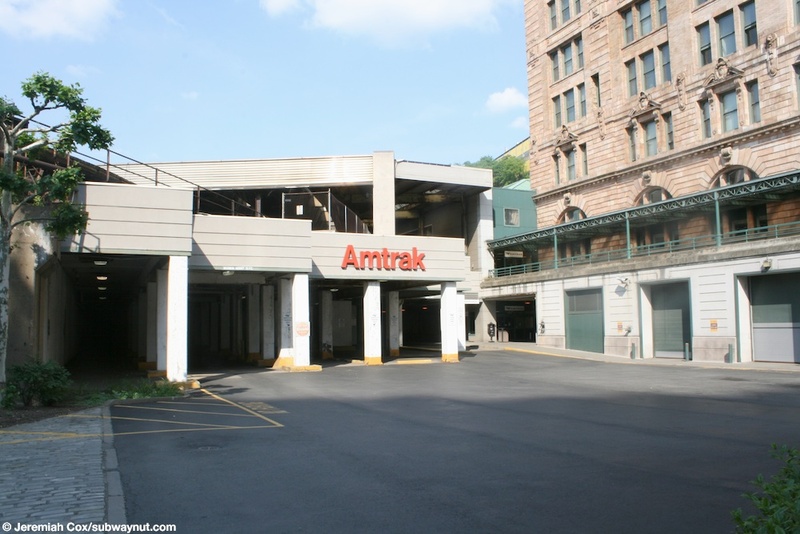 The stations another stop where Amtrak's been renigated outside what was once a grand Penn Station, this time the station has been rebuilt to condominiums (the station's office tower) with no public access to the former public waiting room spaces, these are the lobby of the apartment complex. 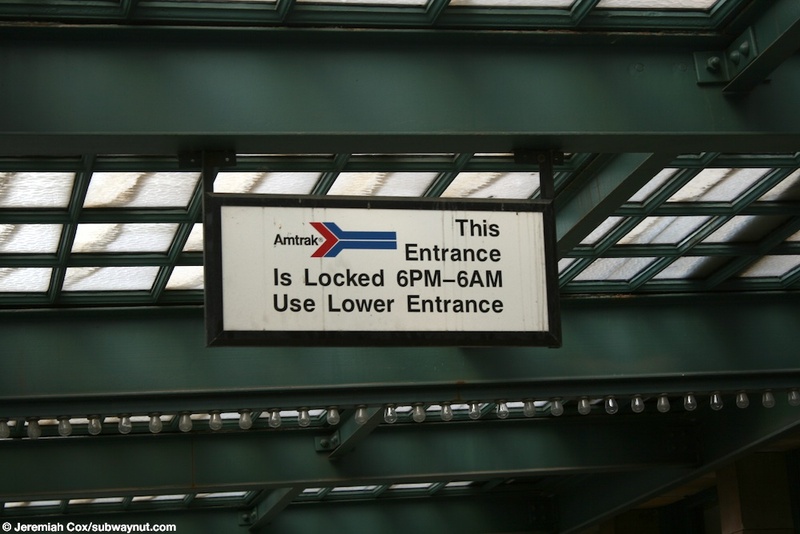 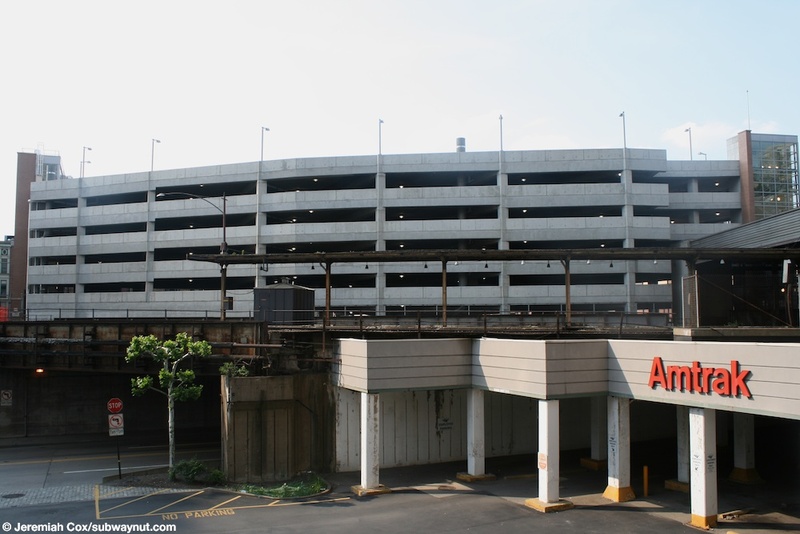 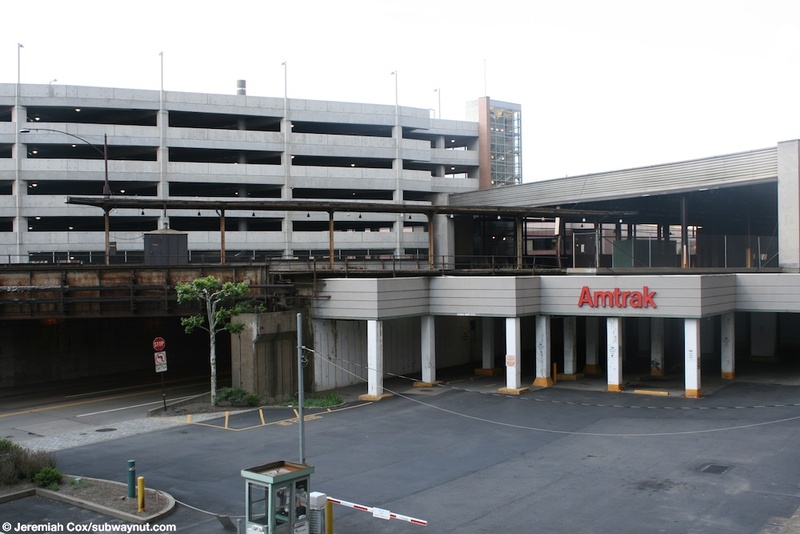 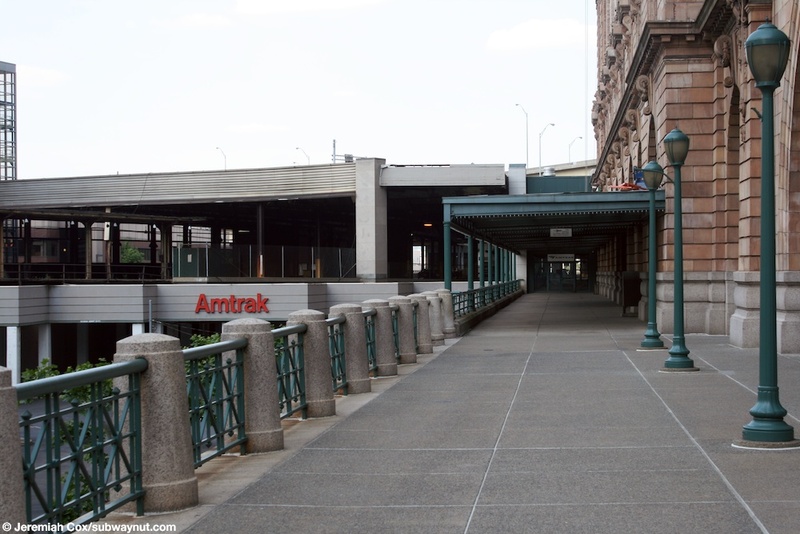 The present Amtrak Station consists of a small car loop area at street level inside a small parking lot. 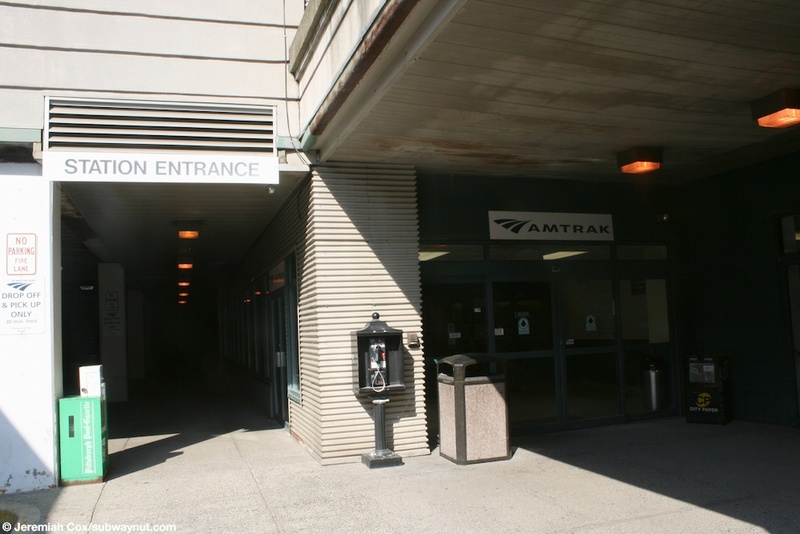 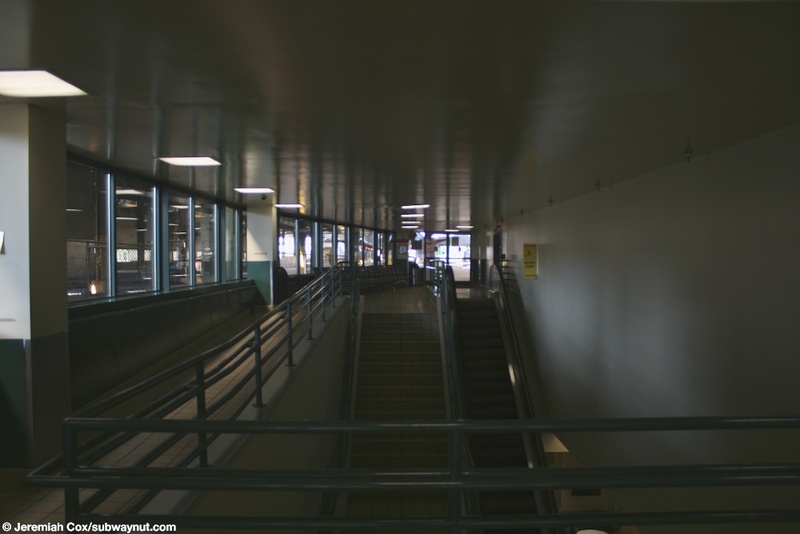 From the parking lot entrance at ground level is the station's small waiting area and ticket window and checked baggage area, a staircase and up escalator lead an upper landing where doors lead out to the station's canopied platforms. 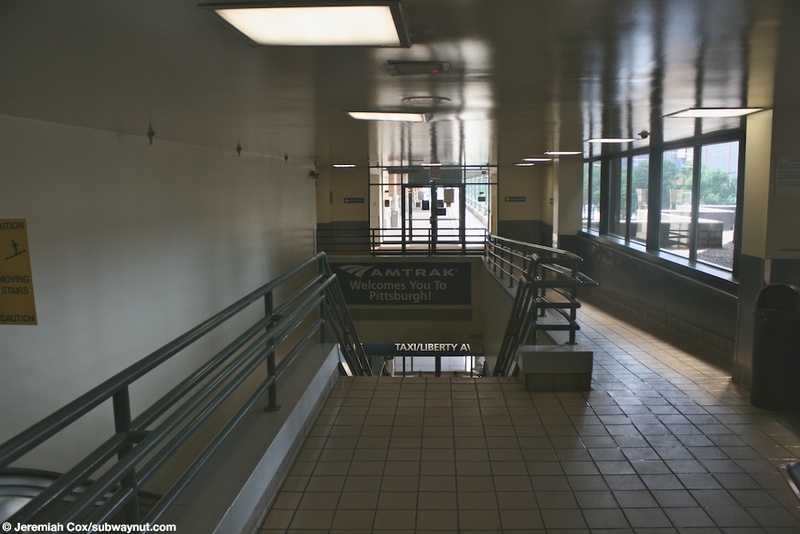 From the upper level an additional exit leads to an outside bridge alongside the old Union Station, it has a sign saying its only open from 6AM to 6PM this isn't useful for passengers because all train departures and arrivals except one are outside this time period. 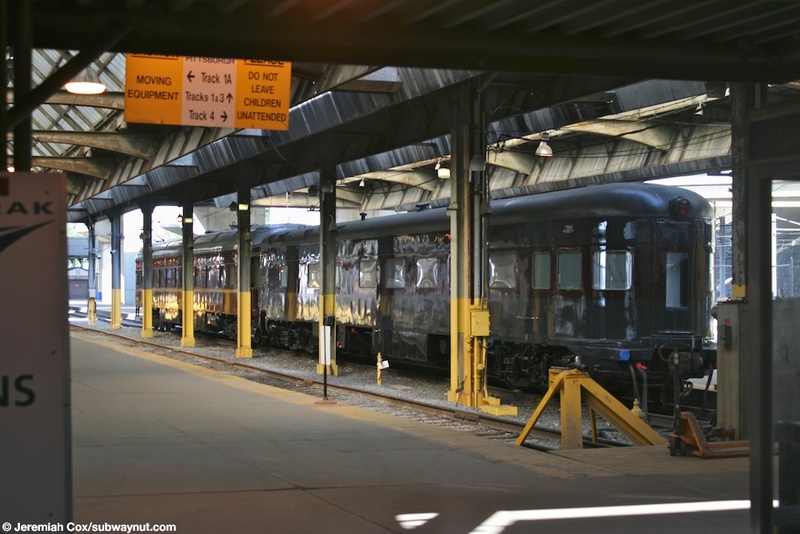 Service is presently provided by the Capitol Limited which connects passengers (with a late night or wee hours of the morning layover) to the Pennsylvanian, a local state supported train to New York City via Harrisburgh along the route used by the Broadway Limited. 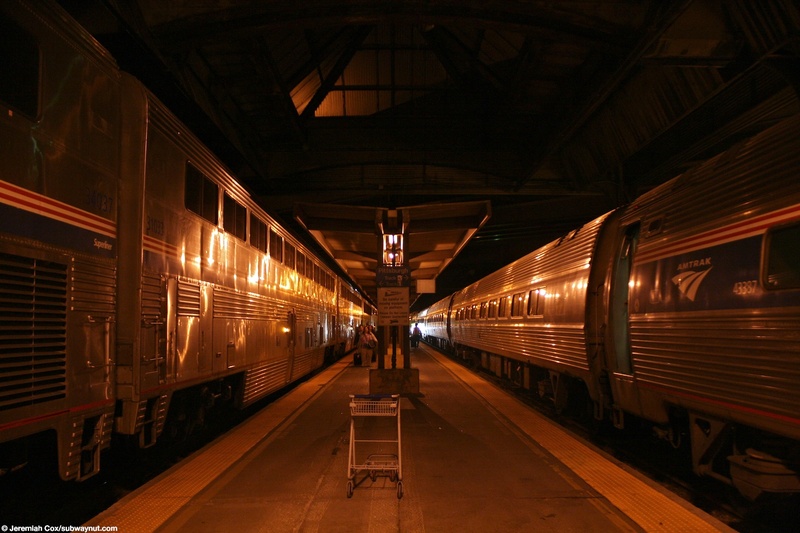 The Broadway Limited was Amtrak's original flagship train to Chicago from New York (with a Washington Section in the early years) which ran from Amtrak's beginnings until 1995, when it lost (and then regained) sleeper service being renamed the Three Rivers until March 7, 2005, when it was finally discontinued, and replaced by the daytime Pennsylvanian connecting to the Capitol Limited (thru coaches are presently in the works). 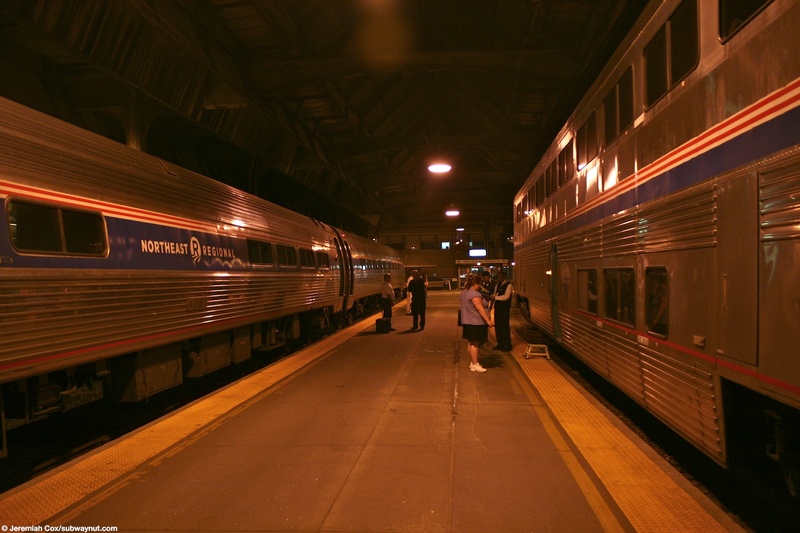 From 1980 until 2004 the route to Harrisburg and Philadelphia saw a second daily train (to supplement the Three Rivers or Broadway Limited) called the Pennsylvanian, this was extended to Chicago as well from November 7, 1998 to January 27, 2003 to accommodate Amtrak's attempt into the express freight business. 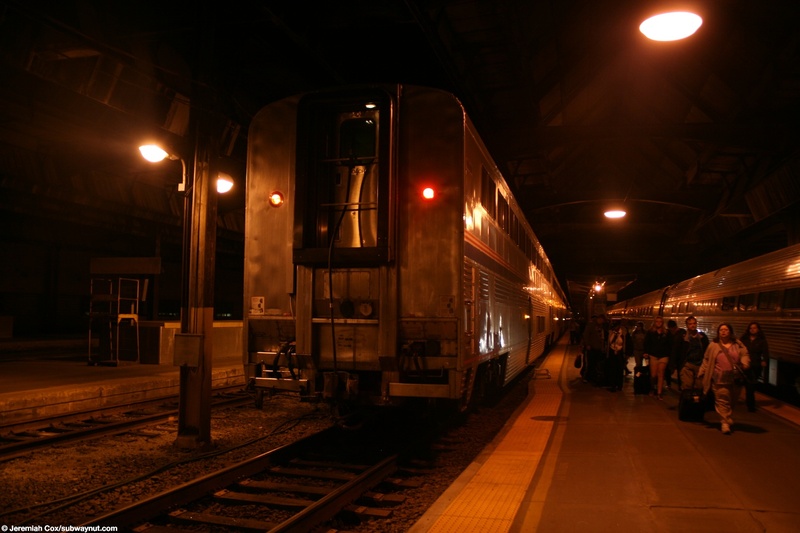 The Capitol Limited, presently the only train to Chicago first began in 1981 and has run every since. 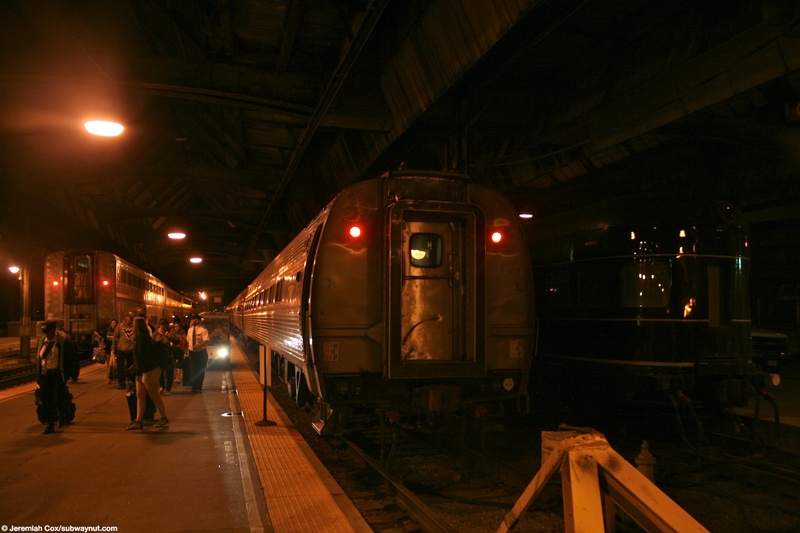 The just arrived Capitol Limited next to the overnighting Pennsylvanian. 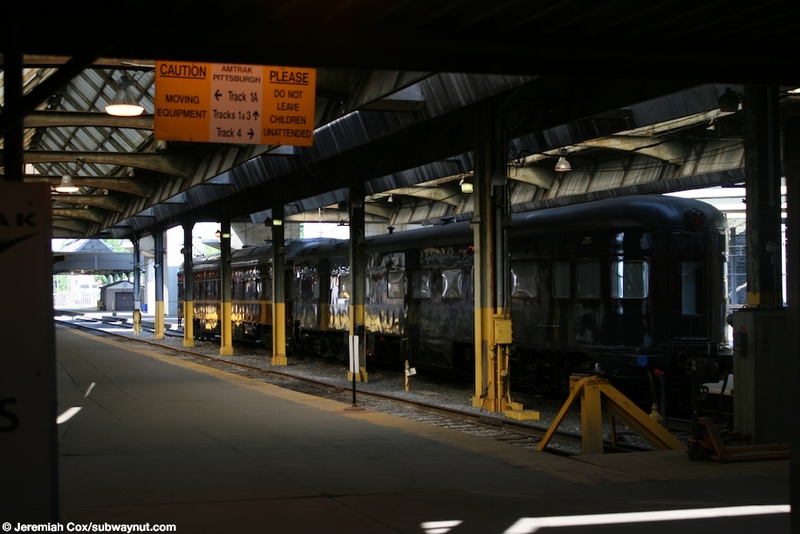 The Pennsylvanian is using a Northeast Regional Cafe Car with the logo on it.